I have to admit I love old stock certificates. I don’t collect them, but I think they really convey a sense of history to investing. Most of the old stock certificates you find or see online, belong to companies that died out long ago. Time has a habit of doing that. 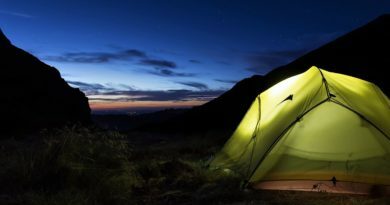 Many investors spend a lot of time trying to pick winners in industries where the odds are tilted heavily in the investor’s favor — technology stocks and internet businesses come to mind as “popular” industries to invest in right now. For a time, many investors do pretty well with this kind strategy… but eventually the world changes. Then it all comes crashing down. The process of trying to pick good industries or good business sectors strikes me as one of those requiring intelligence. Get the answer correct and you’ll do well. Get the answer wrong and you’ll do poorly — A ton of consistent intelligence is required. In other words, what industries chronically underperformed, so that “not stupid” investors can avoid them? The problem (of course) is finding data to answer questions like these. Without a team of researchers, I’m pretty limited in what I can do. 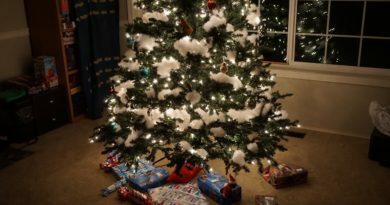 Thankfully, a little Googling turned up a number of interesting resources — The vast majority of which were journalists reporting on which industries did badly this year, over the last three years, or maybe even five years. That’s great, but I wasn’t really interested in the short term trends because of market fluctuations. I wanted to know if certain industries had underperformed for decades, which is my preferred holding period. This industry data does exist, although only in a very limited form that’s not easily digestible. If I had a collection of interns, I’d have them crunching those numbers day and night. The best answer I’ve found to a number of these questions was buried in a Credit Suisse Research Institute publication. Credit Suisse puts out a number of interesting investment publications, but one year in particular addressed this long-term returns question — Yearbook 2015. The research publication looked at industry performance compiled from two big data sets — one from 1900 to 1925, and another from 1926 to 2014. What did they find? The world has changed considerably since 1900 (duh! ), and almost no industry has survived unscathed. (Yep, no surprises so far.) Many industries like candles, matches, and railroads that were once a extremely important part of life, have been reduced to near insignificance in our modern economy. Other industries like Banking and Healthcare have grown in importance, while many of the BIG industries that make up our economy today didn’t even exist in 1900 — Tech firms, Oil & Gas, Telecoms, and Media companies are all pretty new industries. Clearly internet pizza delivery didn’t exist back then, or it would have been HUGE. 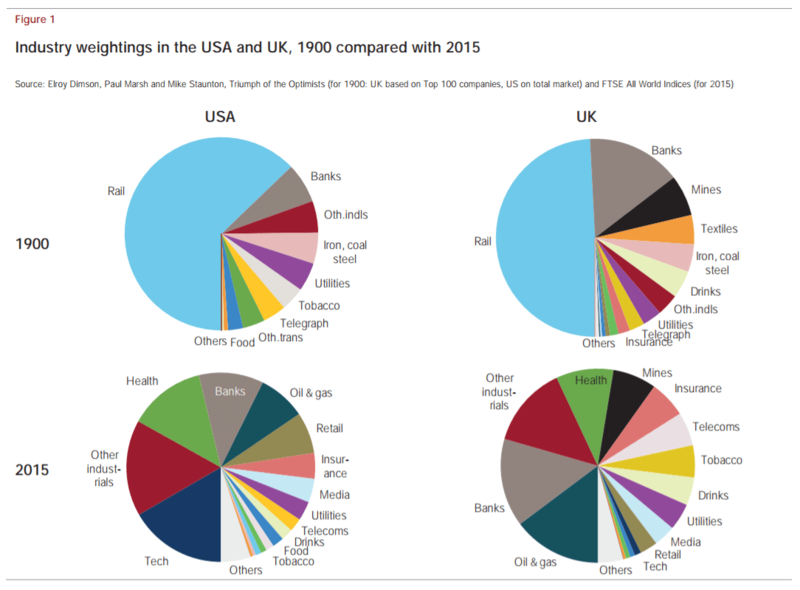 In 115 years, the US and UK economies remade themselves completely. I find these long term studies extremely interesting — We all know change happens, but it’s hard to fathom just how much change the economy has endured since those days. They didn’t have Netflix back in good ole 1900, but were no strangers to industry disruption. How much technology and innovation has changed our economy I find fascinating… but what I really wanted to know was the long-run performance numbers. For industries like Banking, and Railroads that have existed continuously since those times, which of those industries did well and and which didn’t? Well, of all the 48+ industries covered by the data-sets, only 15 have existed throughout those 115 years. Some industries, like alcohol did not have a continuous existence due to Prohibition, but probably would have done pretty well. One dollar invested in the market in 1900 would be worth $38,255 today — A 9.6% annualized return. Too bad they didn’t have index funds in 1900 (another modern innovation). Immediately a couple things jump-out at you — ship building, textiles, and steel were the biggest laggards. One dollar invested in shipping would be only worth about $1225 while the market average would have returned $38,255. The contrast between the winner and loser industries is startling. Tobacco, Electrical Equipment and Chemicals absolutely crushed the market over the same time period. Labor costs may have been a factor — Ship building, textiles and steel have (mostly) moved to countries with lower labor costs for efficiency reasons. Industries like Tobacco, Electrical Equipment and Chemicals are not really labor intensive industries (nobody is hand-rolling your cigarettes or mixing vats of chemicals). Those products are generally made by machinery or are otherwise automated. It’s also interesting to note that industries that underwent huge declines in importance (like railroads) can actually outperform the market. Railroads are an interesting case because they significantly underperformed the market from the 1940’s until the 1970’s only to make a startling comeback. Railroads are an interesting case of an industry that’s shrunk considerably since 1900, but still outperformed the market. 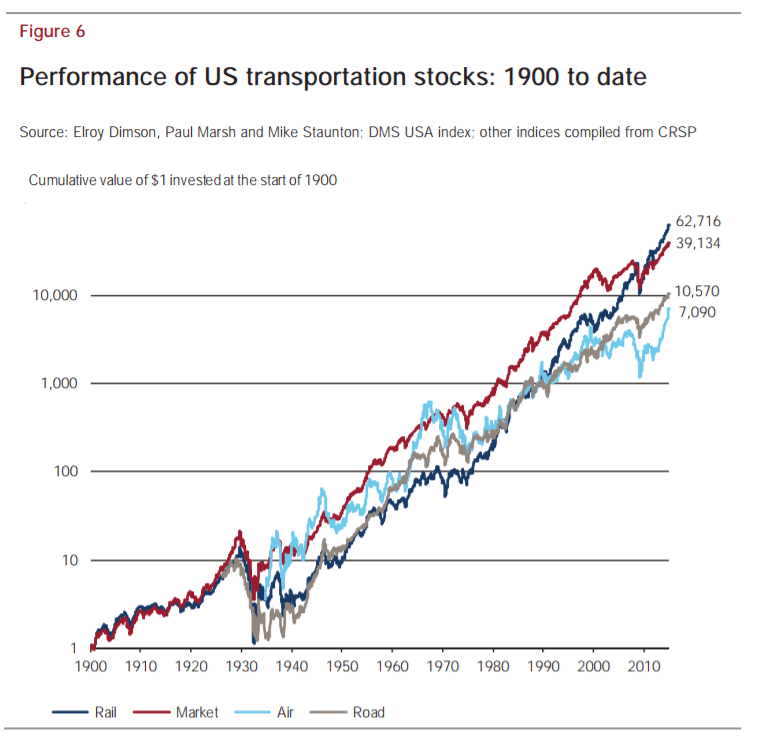 During most of that time period, railroad’s underperformance is probably explained by competition from airlines and cars/trucking. The industry really shrank in importance to the economy. Today, travel by rail in the United States is nearly nonexistent (except for a few Amtrak trains filled with seniors). Most people prefer to travel by car or by plane because it’s faster. But railroads continue to live on today as shipping companies that move goods across America. You might not realize it, but a lot of goods shipped in our modern economy are still shipped by rail. That’s right — that package you ordered from Amazon last week and is delivered by UPS Ground (typically 5 – 10 days) is actually rolling across America in a rail car. It’s simply more efficient to ship by rail over long distances (and in many cases it’s faster) than via truck. There we go again with that word — efficiency. Ultimately I didn’t find the exact answer to my question, but the search for the answer did result in some “learning” points. One, avoiding underperforming industries is essentially a fruitless endeavor unless we have the power to predict the future. We can’t know which industries will survive unchanged by technology and time. Some industries (like rail), might be in decline for years but can still ultimately achieve market outperformance. I’ve talked about companies in the retail industry on this blog a couple times. Retail as an industry might just fit a similar model to railroads — an industry in steep decline, but one that could still contain some efficiencies that keep it around for awhile. Only time will tell. 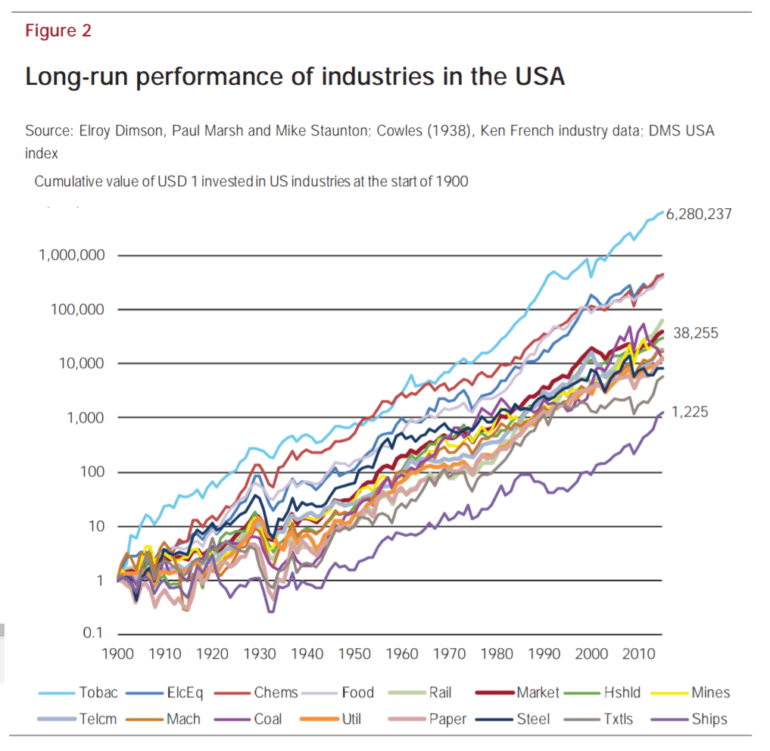 Another big point from the Credit Suisse report is that stock market performance (aka industry profitability) has nothing to do with the importance of an industry to the economy. Tobacco stocks (for example) have always been a tiny piece of the economy, yet they’ve provided market beating returns despite big revenue declines. I’ve written about Phillip Morris’ (MO) remarkable performance in previous posts — it’s astounding. Simply put, stock market performance has more to do with industry structure than it does with the economic importance of an industry. This brings me to the biggest take-home point in my search for lagging industries … efficiency. Throughout time, the U.S. economy has reshaped itself around meeting customer needs efficiently. Want to travel somewhere fast? The invention of the airline crushed the passenger rail industry, despite airlines being a chronic underperformers. It was a more efficient way to move people quickly. Want cheap but decent quality clothes? Moving textile manufacturing overseas was the more efficient way to go. Domestic textile makers performed poorly in the face all that low-cost competition. The story of efficiency and technology delivering that efficiency to the world is one told a thousand times throughout history. Merely picking “technology” stocks to follow “trends” has a habit of delivering temporary outperformance … followed by dramatic underperformance as those stocks revert to the mean. The Innovator’s Dilemma teaches us that technology stocks aren’t necessarily “innovative enough” to deliver true change. True disruptive change has a habit of coming out of nowhere, and destroying incumbent “technology” industries. Anybody remember flopping disk drives? For now, I’m going to hold my Southwest shares (LUV) a little longer despite airlines being one of those underperforming industries. I think the airline industry structure has changed considerably… but obviously time will prove me right or wrong. I’ve heard that you should never invest in something you don’t understand / use yourself. I’m glad Index Funds and such are around for that reason; I’m definitely not willing to invest heavily in industries that I’m not familiar with. The world’s changing at an incredible rate. Beyond making money, I just hope those changes are ultimately for the good. I think you’ll do pretty decent in index funds with a long enough time horizon. There could be a decade where the market is a real stinker, but on average I think you’ll do OK.
It’s also smart to not invest in industries you don’t understand. Buffett calls this the “circle of competence”. Stay within your circle and you’ll do fairly well over time. Great research and analysis. I didn’t know that the candles and matches industries were once so popular. They have all been replaced by modern appliances and technology. People now talk about the software industry as an increasingly important sector, so everyone seems to want to piece of it (i.e. employment, startup). But I wonder if this trend will sustain itself and what will emerge to dominate it. Yep. It’s hard to imagine that matches were once “high tech” business, but if you imagine starting a fire with a flint and steel set, I guess it was. When my dad passed away several years ago he left my brother and I the actual stock certificates for 1100 shares of Wal-Mart stock that he had bought for less than $1 per share in the 80’s. I didn’t even realize you could own physical stock certificates until that happened. His investment did pretty well increasing from $1000 to $80,000 in 30 years. Wow, that’s an incredible return! Congrats! Do you still own those stock certificates today? Physical stock certificates have become increasingly rare, but I’ve heard you can still get them if you’re willing to pay a pretty hefty fee. No, I personally don’t hold individual stocks so I sold mine and to handle the estate we had to convert then to electronic shares so we could split them between my brother and me. It was a small part of the estate. My dad never made more than 70k in his life but he had 7 figures invested when he passed at 90. He was a millionaire next door original! I’m sticking with low-cost index funds for my portfolio because I don’t have the interest to do the type of analysis you’re doing. But you’re one of the few people I think should invest in individual stocks because you have the right temperament, interest, and analytical skills to do it. Have you ever looked at CAPE by sector? Does it add anything useful to your analysis? Thanks Mr. FreakyFrugal! While I do hold a ton of index funds, I mostly try not to be “stupid”. So rather than having a set it and forget it strategy to investing, I continually try to educate myself. I ask myself questions like the one in this post. Hopefully I keep learning over time. CAPE by sector is an interesting idea. I’ll see if I can find the data. Interesting topic. When I was cleaning out some old boxes from my fathers house I found some old BRIC (British Columbia Resources Investment Corporation) shares. Unfortunately they are worth less than the paper they are printed on , but they look pretty cool and I keep them in my desk as a reminder of what not to buy. They might not be as worthless as you think. People pay good money for old stock certificates. They’re collector’s items. Check out sites like oldstocks.com or even ebay. They can go for quite a bit of money. 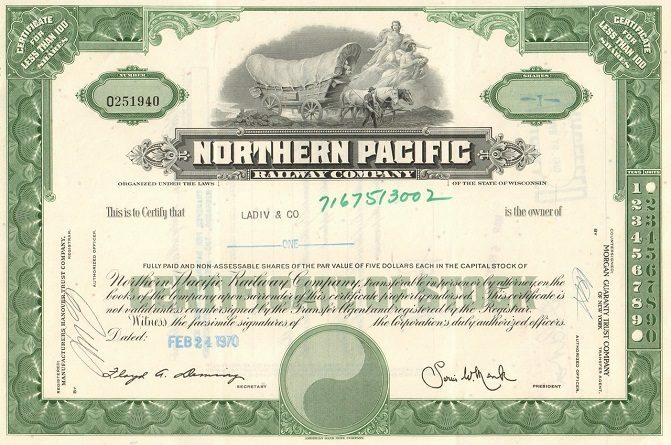 The Northern Pacific certificate that you see at the top of this post was selling for $40. Thanks for sharing your analysis! Actually I was planning to buy some Phillip Morris (MO) once I got more USD into my account (buying more USD with Canadian dollars). I would love to get a stock certificate for our newborn baby, it would be a nice collector’s item for him. Hi Mr Tako! Thanks for your informative blog! I’ve read The Little Book… and am in the middle of The Future for Investors. Thanks for those suggestions! We are planning to open a taxable account this year with a focus on dividend stocks. 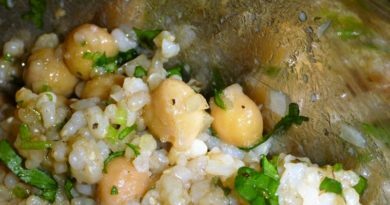 I am wondering if you could suggest any specific sites (Fidelity? Scottrade? Motif?) for investing in individual stocks. We have accounts at Vanguard already, but I noticed that their fee for trading individual stocks is higher than Fidelity. I am thinking that if I use The Little Book’s advice for part of our investment, I will be racking up quite a few fees over just one year of purchasing up to 30 individual stocks, especially given the total amount I want to try investing in that way. Any suggestions? Both Vanguard and Fidelity are stand-up operations. Both have great index funds, and they’re in a bit of a price-war right now. That said, trading fees are cheaper at Fidelity. Why not have accounts with both companies? As far as trading fees in relation to the amounts invested, I suggest keeping your “expense ratio” lower than an equivalent index fund (0.1% or less). In the case of Fidelity, this is a minimum of $5,000 invested for a $4.99 trade. If you can’t stomach those amounts, sticking with index funds is probably a better option. That’s a great way to look at it. Given the buying and selling within about one year, I suppose that would increase it to 10K per stock at Fidelity, though! However, given the higher average return, a smaller amount per stock should still be okay. Do you use the one-year turn-around suggested in The Little Book for part of your strategy or just the suggestions on PE ratio and ROA to spot good long-term investments? From everything else I’ve read on your site, it seems you mostly invest longer term, but you did include that book in your list, so it makes me curious about your entire strategy. I get 24 free trades with Vanguard. Karen, if you have other money with them, I’d ask about that. Thanks for that information, Jacq! Great analysis Mr. Tako. Rail is pretty big in Europe still (passengers and goods). You’re right, rail remains to be quite efficient for long distance transportation of goods. The other thing to consider is that businesses also “change” their industry. Look at IBM for example. Did you know that IBM existed back in the 1800’s? Saw one of IBM’s devices at a historical museum recently. I knew IBM was old, but not that old! What kind of machines did they make back then? That was pre-typewriters. Trying not to be stupid….AWESOME! I remember old black and white movies always having a scene where railroads and the train station was involved. When I used to work in DC, I commuted on the train and then on the metro. Still many people use this form of transportation especially those that live in the suburbs to go into the city. I don’t see it going away, but at the same time cars and telework options have decreased it significantly, at least for commuters. So many things can change over time, and no one can predict which industries will flourish and which will die off. One things is for sure though…the more flexible ones, the ones who embrace change are the ones that survive and prosper. Just like people…the ones who have backup plans for unexpected events, and can change, grow, and adapt are the ones who prosper. Awesome post Mr T. It is quite astounding to see just how much the UK and US industries changed over the past hundred years (except for UK banks, though I imagine many of the individual banks have come and gone). Rail is still reasonably important in Australia, although I wonder about how it will compete going forward. I think if they had a high speed east coast NS line and a EW line from Sydney to Melbourne to Perth then it could be used for freight and travel by far more people. At the moment the only real way to make a quick(ish) interstate journey is by Air. Awesome analysis, as someone who has left Oil and Gas with a load of company stock, one of our big decisions is when to sell them. With a lot of countries in Europe already setting dates for phasing out of petrol vehicles I can easily see O&G companies value collapsing over the next 30 years unless they pivot to renewables. Looking back at the losers is a fascinating way to think about what winning may look like in the future. Companies that made stage-coaches died out, but the companies that made sewing machines are still around. I doubt that the analysts of the time would have predicted that.